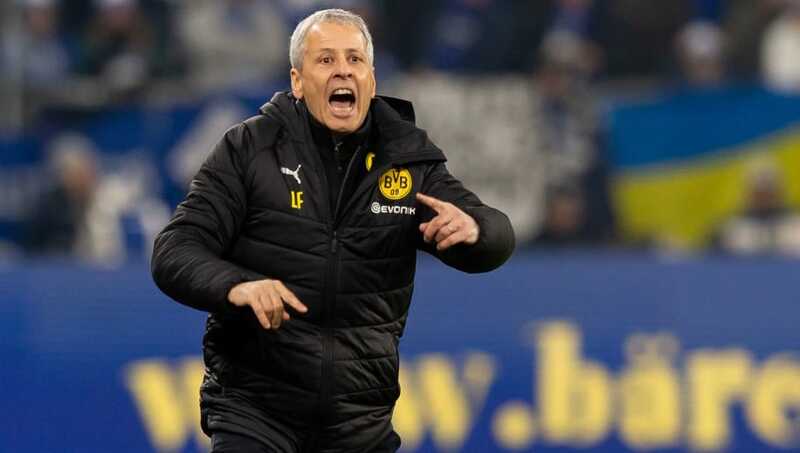 Borussia Dortmund manager Lucien Favre highlighted the way his side bounced back from throwing away their one-goal lead against bitter rivals Schalke 04, where Jadon Sancho went on to score the winning goal in the Revierderby. The Black and Yellows scored the quickest derby goal this millennium when Thomas Delaney converted a free kick, but Daniel Caligiuri was able to bring Schalke back on level terms when VAR awarded the hosts a penalty. Just days after his grandmother passed away, teenager Sancho then showed brilliant technique to fire the winning goal past Ralf Fährmann, ensuring Borussia Dortmund extended their lead at the top of the Bundesliga table to nine points. "It was a very difficult match for us, particularly in the first period," Favre said, quoted by the club's official website. "Schalke were very well organised and did their pressing and counter-pressing well. We didn't have enough possession, didn't create enough chances and only opened the scoring following a free-kick. "I can't comment on the penalty that made it 1-1 yet because I still haven't seen the incident. If it was the right decision, then we completely accept that. But the team stayed in the game. I liked that. "We continued to play football and played even better, we had more possession and more goalscoring chances. It was important that we kept our cool. We ultimately deserved to win the game. We had more possession, more opportunities to score, but it's always difficult to play against such teams." Borussia Dortmund now have somewhat of a throwaway match to conclude the Champions League group stages, where three points over AS Monaco will only have significance if Atlético Madrid fail to beat Club Brugge. Bundesliga action then returns for the Black and Yellows against SV Werder Bremen, before the first half of the season comes to a close against Fortuna Düsseldorf and Borussia Mönchengladbach.